With our last update having come out a few weeks ago and the next one a few weeks out, we wanted to let people know what we are working on. In addition to "The Passing" DLC, we are working on some other updates coming for both PC and 360. While not a complete list by any means, we wanted to give a heads up on a few Versus changes coming. We are adding bots for the Infected team to help out the Infected when they are down a man or two. This will also make 1v1 Versus a bit more fun. We've also been experimenting with a solution for auto-spawning in Versus finales. Even though it's pretty obvious from the L4D forums that EVERYONE LOVES auto-spawning in finales, we figured, what the hell-we'd just go ahead and remove auto-spawning anyway. But before we make any change to Versus we always need to see how the game is currently being played. So how do finales currently play out? 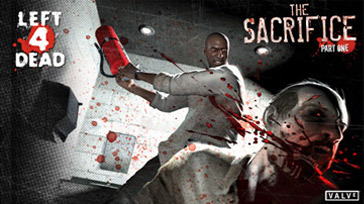 Across all finales in Left 4 Dead 2 currently, a single survivor has a 34.56% chance of escaping. That includes the Concert Finale in "Dark Carnival", which boasts close to a 50% escape rate (and yes, a fix for everyone's favorite cheese spot is coming). Remove the Concert Finale, and we see the average drop to 29.61%. With these figures in mind, when we make changes, we can measure the difference and see how much the change impacted the balance. Another stat we often see discussed: What gets played more, Versus or Campaign? It really depends on the day, as they are almost always statistically tied. They are unquestionably the two favorite modes of Left 4 Dead. Also: With work on "The Passing" in full swing, we will soon be recording the actors. First up in our recording sessions is everybody's favorite suit-wearing zombie killer Nick, played by Hugh Dillon. If you haven't already caught it, Hugh's show Durham County has been picked up by ION and is on Sunday nights at 10pm. 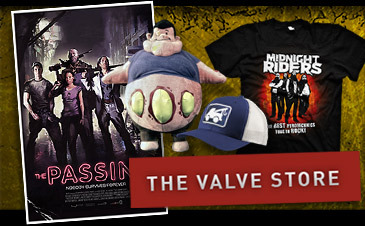 Lastly, in case you missed it, the CG Society has an interview up with Valve's own Randy Lundeen and Jeremy Bennett.